Experience the danger and excitement of searching for long lost treasure. Explore the ancient pyramid, but beware the "Curse of Pharaoh". 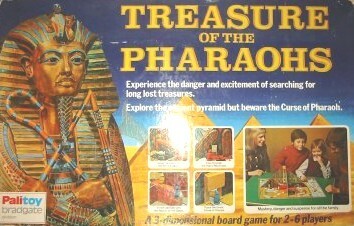 Treasure of the Pharaohs is a 3D board game published by Palitoy in 1974. The game was no doubt inspired by the Tutankhamun exhibition, which was held in 1972 at the British Museum in London, attracting around 1.7 million visitors. This was such a huge media event that the whole of Britain went Tutankhamun mad and interest in all things Egyptian soared. The game is visually quite impressive when set up, making it very popular with collectors. The object of the game is to be the first player to discover the treasure, which is hidden in the sarcophagus. I was contacted recently by Bob Brechin, who was the chief designer at Palitoy. He tells me that the original idea for Treasure of the Pharaohs came from an outside inventor (possibly Tom Kramer from Seven Towns) and Palitoy redesigned it. Bob put a designer called Merl Evans to work on it. Merl designed the Howard Carter style playing pieces and other plastic components. He also thinks it was Dave Barnacle from Roy Hastings Studios who designed the card and box artwork. Price: From £150 plus postage.